A disturbing new trend is arising in the knitting world. Limit the amount of information given to the knitter who pays for your pattern and try to hog tie the person who paid for the pattern by preventing any transmission in writing or speaking about anything in the pattern. I think some of the new “designers” out there need to get a grip on themselves. One trend I am seeing more and more are designers who no longer allow knitters to purchase patterns that have size ranges. What the knitter gets when he / she buys the pattern is information to make only one size, thus preventing the knitter from making a second garment for a friend or relative who may be a size larger or smaller than the knitter. If the knitter wants to make any size other than her own she needs to pay a second time for the same pattern in the other size. I refuse to tech edit the patterns for these “designers”. I refuse to test knit their patterns. They are in direct violation of the copyright law. They cannot, in good faith, charge the knitter twice or more for the same pattern with different numbers. They do not own body measurements. Here’s a little surprise I’d like to share: Body Measurements are public domain information. Any knitter out there who pays money to find out body measurements has just thrown away their money. The information is all over the place free of charge. The second disturbing trend tries to copyright idea, procedure, process, and system for knitting methods that cannot be copyrighted in this way. The “designer” in this case claims ownership of short row techniques. The knitter pays for a pattern filled with all types of warning that the information contained within cannot be shared in writing or speech with another person. Frankly, I think the CIA has less stringent rules covering the conversations of spies. Short rows are a procedure, a process, a system. They’ve been around forever. They cannot be copyrighted. No matter how you use short rows, whether you knit them while standing on your head, they are not subject to copyright laws. Knowledge is power. It is the ultimate in power, even beyond money. I am greatly disturbed by the amount of knowledge some people try to prevent other people from getting. It is not a sign of a healthy, thriving civilization or culture. Do you ever wonder how all those rulers in the Dark Ages and Medieval times ruled so many people over vast expanses of land? The rulers kept the people ignorant. Ignorant people are easy to rule, and are easy to lie to. In short, they are easy to herd which ever way you want them to go because they know nothing different except what the rulers tell them. Knitting has never been based on keeping secrets. In order for the craft to flourish it needs open and honest sharing. Historically, knitting knowledge was not something you paid for. It was freely given. Passed down from great grandmother to grandmother, to mother to daughter. This movement to restrict knitting knowledge stands in direct opposition to how the craft has developed and survived. In restricting the knowledge you can effectively kill the craft. I sincerely hope this is not the way we are heading. At the moment I have a number of vintage crochet patterns that need grading. No not the kind of A, B, C, grades one gets in school, rather it’s sizing them to fit current measurement standards. So how do I go about grading vintage patterns when, as we all know, no actually true sizing standard exists? Lots of research. While I am easily familiar with baby and children’s sizes I am not so with women’s sizes. I can look at rows and rows of figures for children and pick out which ones are out of sync by eye. Not so with adult sizes. Having worked so long with small people’s dimensions, the world of adult sizes all look so…big. I feel like my little seven year old self who, when going clothes shopping with my Nana in the “big” stores, sensed exactly how small I was in the scheme of things. Along with that sense of smallness came the attendant feelings of awe and fear. I remember that when it all became too overwhelming for me, I hid in the middle of circular racks of clothing. My Grandmother would search the various racks until she found the two stick thin legs ending in scuffed and torn sneakers sticking out from the bottom of the rack below the clothes. I always felt a sense of rescue at that point. She had finished shopping and I knew I’d be whisked back to her car, driven away from the store and returned to my smaller world. Unfortunately, today I don’t have a circular clothing rack to hide in. I have considered my closet, but the amount of things I’d need to “rearrange” to fit myself in there and close the door is daunting. Today there really is nowhere to run, nowhere to hide. Being an adult is like that. I have one gem of information to share from my foray into the world of adult sizes: Bust size is not chest size. The bust measurement taken at the fullest part of the bust is just that. To find a woman’s chest size the measurement is taken with tape measure wrapped around the chest under the bust. It is the chest measurement taken from under the breasts that decided bra size. The difference between the bust size and chest size determines the cup size of the bra. A 4″ difference is a D cup, 3″ is a C cup, 2″ is a B cup, and 1″ is an A cup. Why is the chest size important? Divide the number in half and it’s close to the crossback measurement. So for those women who don’t have someone to measure crossback try measuring the chest and dividing it in half. Subtract an inch or half an inch and viola! crossback measurement. And now I am going to look for a clothing rack work on sizing these patterns. When I decided to give my brain and nerves a break before they ruptured on their own, I put away all my math toys including pens, graph paper, rulers, and calculator. I needed to stop running numbers in my brain all day regarding stitches to inches to centimeters, to half the circumference of 8 different sized heads, 8 different head and neck lengths, and 8 different front to back measurements. I needed to stop chasing my tail like a crazy dog. When the sock yarn arrived I made it my vacation away from designing project planning to follow the sock pattern in a mindless manner. This was, I thought, the easy-peasy rest my brain and nerves needed. The yarn, Lorna’s Laces was a familiar brand. I use it often. I’ve never had the colors pool poorly on me, until now. I’ve completed 8 inches (20) cm of the leg—I prefer to make my socks toe up, but the pattern was for cuff down and like I said I wanted to follow the pattern with my brain on auto-pilot—and the colors are pooling in a helix kind of way that I can’t stand. I can live with striping, but not this type of striping. I put the sock on and twirled. It looked just like an old fashioned barber pole. Now, I know The Skipper won’t be twirling in his socks, but the way it looks sets my teeth on edge. Right now I am trying to find balance between my tech editing work, my design work, and knitted work. In between I need to find time for The Skipper and of course, time for Yarn Rascal. The latter demands most of my time. His deviant behavior is on the rise and I don’t want him to be a life-long criminal. Thus, while he is still in the formative period he is getting a good portion of my attention. One of the tech editing projects is a Raglan sweater. Personally, I dislike Raglans. I don’t like their fit. I disliked them even more when I found the back story of their development. A lesser noble, named Raglan, was in the British service and lost one arm in the Crimean War. His tailor created the Raglan to better accommodate the loss. Thus a sweater constructed for a one-armed individual found its way into fashion for two-armed individuals. The pattern I am editing is a three act drama. 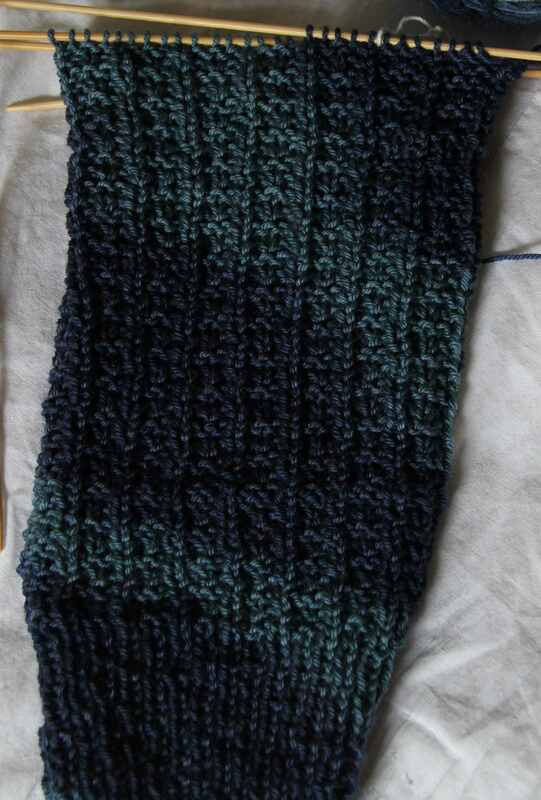 Act One opens with sketchy information concerning color changes and a ribbing pattern. Act Two begins with the realization that the Raglan shaping at the armholes for the Back and Front don’t match, and they must. Act Three starts with incomplete sleeve directions. Beyond the wrist Cast On no other directions exist. In all fairness, this is a vintage pattern I am piecing together, meaning I must recreate the missing information because it really no longer exists. Completing this pattern is the focus of my weekend. In the meanwhile, I need to knit the second of the Cursed Socks, create a swatch for a lacy pair of bed socks that exists only on the drawing board at the moment, work out the elements of the All Little Boy sweater that is also on the drawing board, and find time to knit on the Shetland Baby Shawl. I’ll have a progress picture of the shawl posted next week. The good news I received this week from the doctors is that the blood tests showed nothing concerning my tiredness. My cancer surgeon is happy with the way I am healing. She wants me to participate in a study about the roles exercise and diet may have in lowering the chances of breast cancer coming back. I’m not quite a year from my operation last January. This time February will be the big month for me. I have a mammogram, ultra sound, and MRI scheduled to see how things are going. The time in between is kind of like the Edgar A. Poe story The Pit and The Pendulum. Yarn Rascal has just left my side. By the curl of his tail I can tell he’s thinking of getting into trouble.